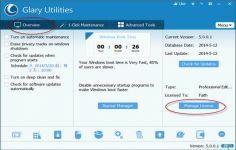 Glary Utilities is a simple and handy system cleaner application to repair any computer failure and boost the system performance. 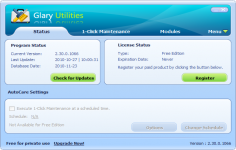 Glary Utilities is a simple and easy to use system cleaner application, developed to help you diagnose and repair any computer failure and also to optimize the system performance. With a simple and intuitive graphical user interface, it offers you the possibility to perform either 1 click maintenance or a custom selection of operations. The application includes a complete set of utilities to perform those operations, such as registry and disk cleaner, program manager, process manager, spyware remover, startup manager, encryption and decryption tools, shortcut fixer and many more.